SAN DIEGO – (Wednesday, March 16, 2016) – For the sixth year in a row, San Diego college students, members of the military community (active duty and veterans) and the general public will come together to workout for charity at Embrace’s 6th Annual Ex 4 Vets (Exercising to Support Our Veterans) event on Saturday, April 9, 2016 at 10AM. The aerobic kickboxing and boot camp workout raises funds for Embrace’s Healing Our Heroes’ Homes program that remodels the homes of disabled veteran homeowners. Embrace, a nationally recognized nonprofit organization that brings diverse groups of people together to serve veterans and civilians in need, will once again partner with fitness guru Cindy Whitmarsh and her fitness team to deliver the event, which will take place on the San Diego State University campus for the second year in a row at the Conrad Prebys Student Union Center. "Last spring’s event was so full of energy and excitement that it was a foregone conclusion that we would return this year if the students at SDSU wanted us back,” said Embrace Founder, Sean Sheppard. The support we received from the university staff and the Conrad Prebys Student Union Center setting makes SDSU’s campus a phenomenal venue. To donate to Embrace click here. The Cindy Whitmarsh fitness team will deliver the 1-Hour long workout. Participants register then set personal and/or team pledge goals for their workout. Participants that form work out teams representing student, military or religious organizations keep 50% of all net pledge funds raised. Over the past 4 years, the event has given back approximately $40,000 to the aforementioned groups. Kappa Sigma Fraternity, the overall top fundraising student organization 4 out of the last 5 years the event has occurred, will be the student organization that partners with Embrace to host the event. “It is an honor for Kappa Sigma to be able to co-host Ex 4 Vets with Embrace this year. It is extremely important to raise awareness about the difficulties disabled veterans face every day and I believe Ex 4 Vets is a great opportunity to do this," said Kappa Sigma President, Mark LoVecchio. Prizes for the top fundraising individuals and teams include 40” flat screen televisions, hopper passes to Disneyland/California Adventure, as well as $400 Walmart gift cards. Greeks will once again compete for the coveted Ex 4 Vets Cup, which goes to the top fundraising sorority and fraternity. A partial list of Ex 4 Vets VI sponsors and partners include the Mike Whitmarsh Foundation, the San Diego State University Office of Diversity, SDSU Kappa Sigma Fraternity, SDSU Sigma Phi Epsilon, SDSU Delta Zeta, SDSU Army ROTC, SDSU Interfraternity Council, San Diego County Fair 5K Race by VAVI, Snooze A.M. Eatery, Perfect Bar and Essentia Water. 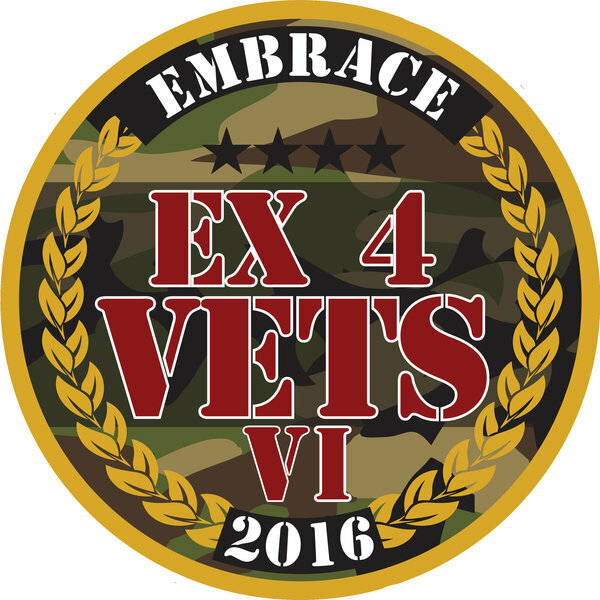 Ex 4 Vets VI is scheduled for Saturday, April 9, 2016 at 10AM. For more information, visit www.ex4vets.org. For more information on Embrace, visit www.embrace1.org. For more information about Sheppard and his life, visit www.thegoodsheppard.tv.